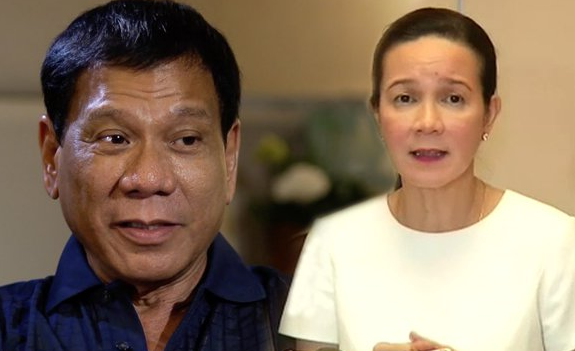 Home / News / Duterte bares Grace Poe's defects: "Ang lakas mong manigarilyo, ang lakas mong uminom ng brandy." Duterte bares Grace Poe's defects: "Ang lakas mong manigarilyo, ang lakas mong uminom ng brandy." Recently, Senator Grace Poe said she understands that cursing is part of the President’s “style,” but this may influence children to do the same. “Sang-ayon ba tayo dun? Basta alam na ninyo kung anong tama at mali. Paalala lang, SPG,” Poe told reporters after the Senate committee hearing on transport network vehicle services. The statement came after President Rodrigo Duterte cursed at former President Benigno Aquino III for criticizing his war on drugs. President Duterte is not about to let anybody get away with lecturing him in public, not the least Senator Grace Poe. The President said that the lady Senator too quick on the draw in handing out "motherhood statements" against his cursing and vulgar remarks in public speeches as if she doesn't have any character flaws. "Lahat naman tayo may depekto eh. Ikaw, anong depekto mo? Ikaw ang lakas mong manigarilyo, hindi alam ng Pilipino. Ang lakas mong uminom ng brandy. Totoo lang," Duterte said. "Yan ang sikreto mo. Ako walang sikreto. Binubuga ko lahat. Sanay ka kasing mag-ano sa akin. You admonish me as if you are the mother. Motherhood ano ka kaagad," Duterte added. “Kung gusto pala nila ng disenteng babae,­ e ‘di sana nanalo ka. Ikaw ‘yung popular, may pera. Ikaw ang blessed ng simbahan,” sabi pa ng ­Pangulo. “Huwag mo akong pakialaman kasi ako nagmumura talaga noon pa,” sabi pa ng Pangulo. In a speech delivered during his visit to war-torn Marawi City Duterte told Poe not to meddle in the issue between him and Aquino because she does not understand his position when he took a jab at the erstwhile president. “Grace [Poe] said, ‘Watch your mouth.’ You take care of your mouth, and I will take care of mine because my mouth is not for your mouth. Stay silent there because you don’t understand from where I stand,” the President said.